Other than my profile picture, this is the first picture of myself I've posted on this site. When I found it the other day, I felt it was appropriate to post. 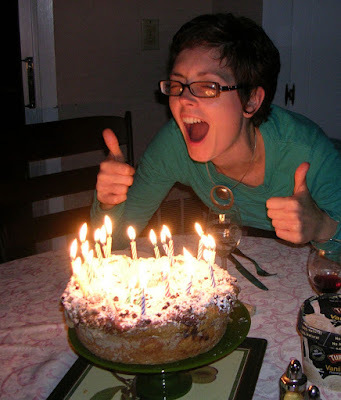 It's from my birthday last year (2008), so it's me and my unusual birthday cake. I initially had my heart set on having a chocolate bundt cake for my birthday, a specific one I that saw in the window of La Guli in Astoria. A few days before my birthday, I went in to ask about ordering one, and the woman working there said, "Oh, you mean the sour cream loaf?" Since I couldn't get the cake I really wanted, I decided to wing it. Boyfriend and I were headed to Long Island to celebrate my birthday at my mom's house over dinner, and there's a bagel shop with a lot of bakery items where I decided to look for something. Maybe it was the ring shape, maybe it was the thought that I could eat it again for breakfast, but what we ended up with was chocolate babka, though it was more like a puffed crumb coffee cake with chocolate.